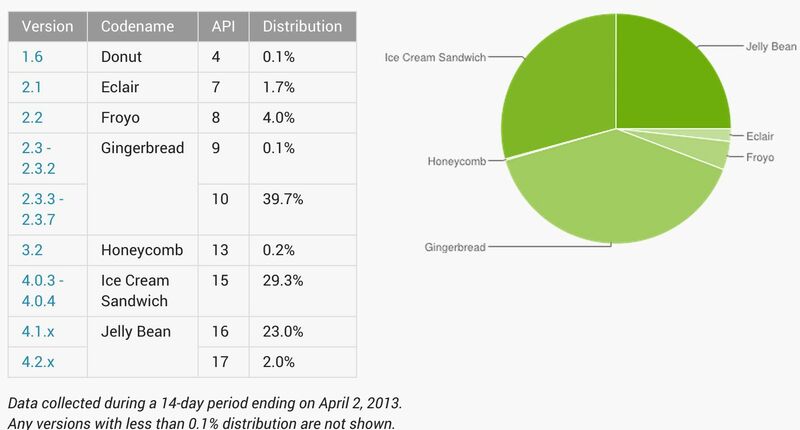 More than half of all Android(s goog) devices tracked by Google are finally running Android 4.0 software or better. The company posted an update on Google+ as well as its dashboard that helps developers target certain device types for their apps. Based on the most recent period of tracking, 54.3 percent of Android devices hitting the Google Play store run either the Ice Cream Sandwich or Jelly Bean variants of Android software. We’ve updated the way we calculate our device dashboards to make them even more useful, and have also updated the data on screen distribution. Note that as a result of these adjustments, some slices in the pie charts have changed more than usual. The new device dashboards are based on the devices of users who visit the Google Play Store (rather than devices that have checked-in to Google servers). As a result, the dashboards more accurately reflect the users most engaged in the Android and Google Play ecosystem—and thus most likely to download and use your apps. This change makes sense from a developer’s standpoint: Instead of counting devices that “check in” — something that could be a simple as signing in or syncing through a Google service — devices that actually visit the Google Play store are counted. Those are the ones that developers are interested in, of course. Since Android 4.0 was introduced in late 2011, it also makes sense for developers to be focused on writing software that supports Android 4.0 or better. I’m not saying Android 2.3 devices shouldn’t be supported any longer — they still account for 39.8 percent of all Androids — but they’re older devices that are more likely to be upgraded soon through a new hardware purchase. Developers will get the most bang for their buck by targeting Ice Cream Sandwich and Jelly Bean devices. The hardware cycle refresh and momentum from handset makers to deliver Android 4.0 or better on new phones is partly why I said in October we’d hit this tipping point in four to six months. Lo and behold, six months later, that’s where we are. Slight change? Really? Massive change: Let’s deliberately present a partial ecosystem snapshot so that it looks like adoption rates are higher. Is Google going to recalculate the number of Android activations, as well? If you check out the lists of latest released Android smartphones from the biggest Asian stores (dealextreme, etc), you will notice that large chunk of them are still versions 2.2 and 2.3, so noteworthy amount of 2.X versions are brand new phones just entering the market. Perhaps, but are people buying them? And do they have the full complement of Google services or are they just AOSP without access to Google Play? You could be right but I think some more information is needed to draw any conclusions.